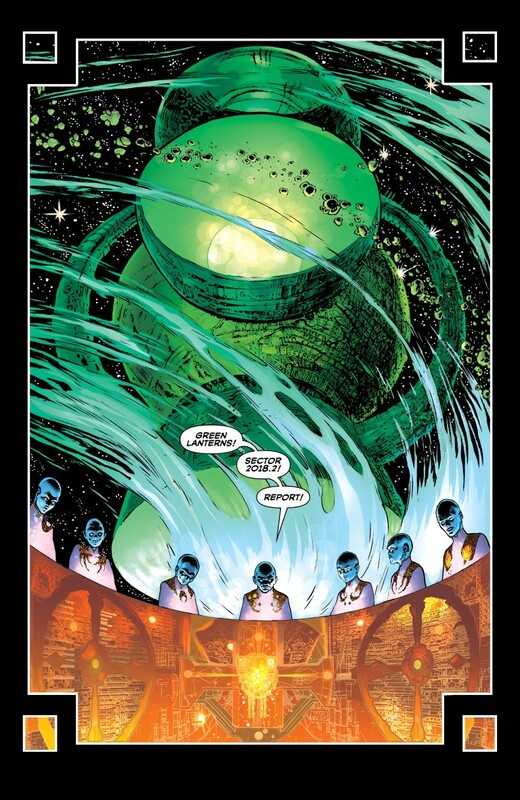 Summary: The Green Lantern is off to a strong start courtesy of Grant Morrison and Liam Sharp... including a touch of 60's madness. 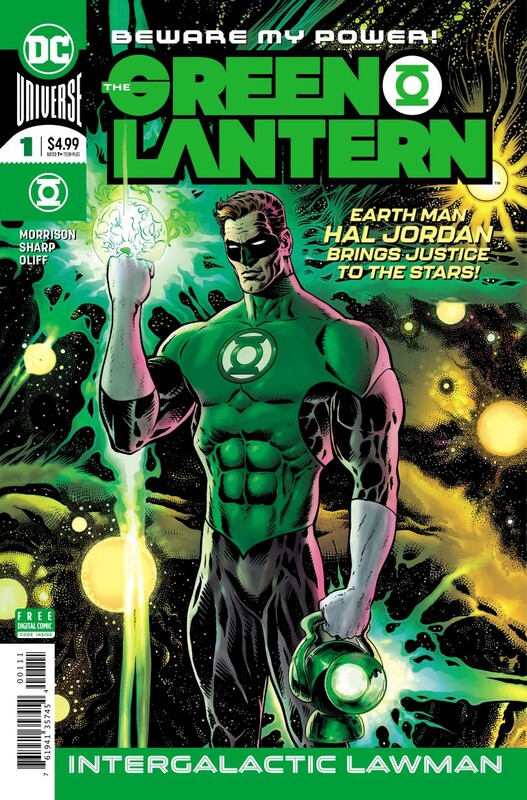 Superstar writer Grant Morrison returns to DC Comics with THE GREEN LANTERN as he takes the reigns of Hal Jordan and delivers this almost Silver Age approach to the worlds most popular Green Lantern. 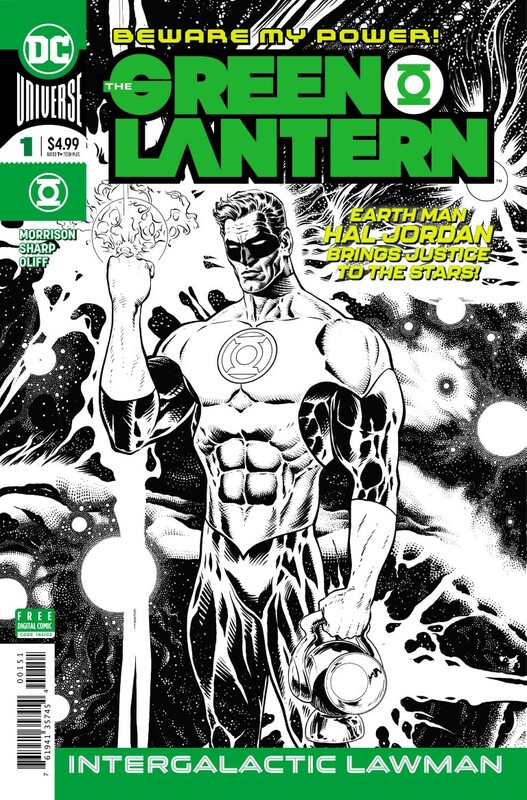 Adding to this space adventure is the wonderful work of artist extraordinaire Liam Sharp whose detail in modern comics is almost unparalleled who draws this almost psychedelic 60’s interpretation of the universe of Green Lantern but with his modern flare. 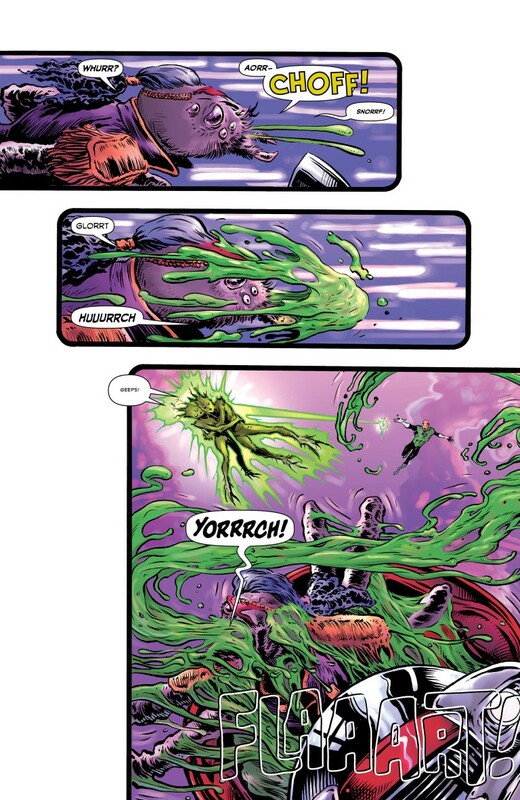 He also captures the story telling of Morrison well… although the Guardians of the Green Lantern Corps are quite creepy. The story begins with Green Lantern Maxim Tox of sector 2018.2 that while on assignment is having a hard time defeating a powerful Vegan Space Pirate. Thankfully his partner Floozle Flem (you gotta love Morrison) who is a super-intelligent all-purpose virus saves the day. 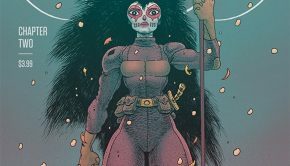 Unfortunately we learn that this Space Pirate is working for the nefarious Controller Mu who has something from the anti-matter universe in his cargo that leads to the death of Maxim Tom. 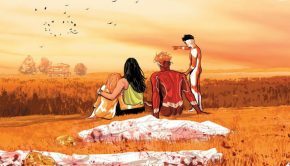 Meanwhile back on Earth, Hal Jordan is living the simple life again as the Guardians of the Galaxy (not the Marvel heroes) have taken his power battery for ‘repairs’ as he lost another job at an night gas station before he spends the night with an unnamed blonde in womanising Hal Jordan fashion. 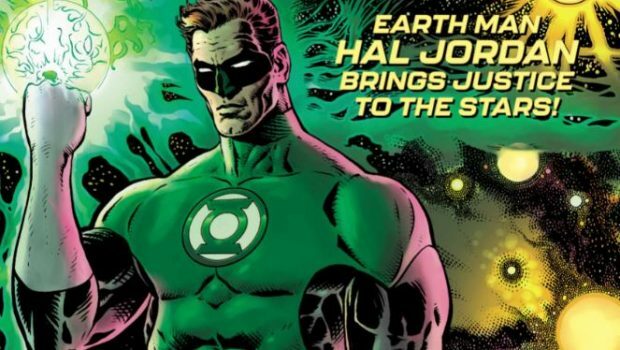 The next say, Hal is on the road again where he encounters a group of aliens under the guise of humans and without his power battery, this Green Lantern manages to use his wits to defeat them with a classic 60’s fist fight. 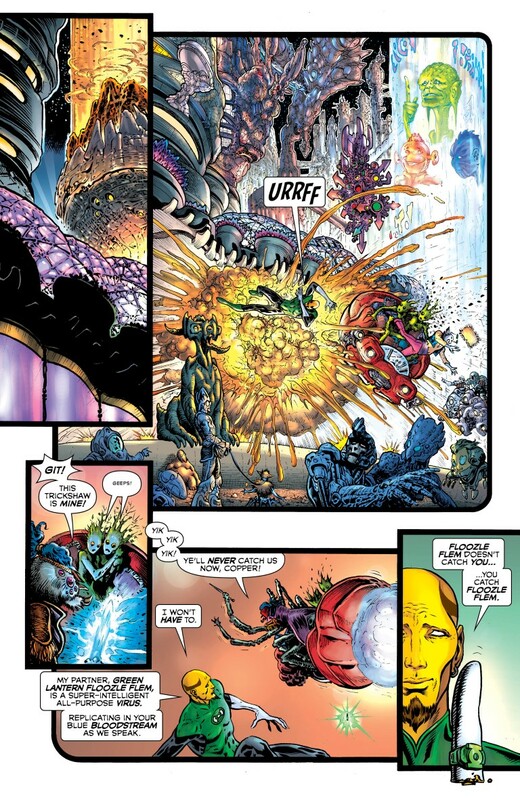 Then in a homage to his origin with Abin Sur, Hal encounters the crashed ship of Chriselon, a fellow Green Lantern who accidentally released three of the universe’s deadliest killers on Earth. Although Chriselon is injured, he does allow Hal to charge his ring as this Earthman easily defeats these interlopers. 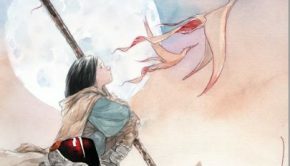 As a reward for saving Chriselon and capturing these killers, he is summoned to New OA where one of the Guardians explains to him that something is corrupting the Book of Oa and that one of their own will destroy the corps. 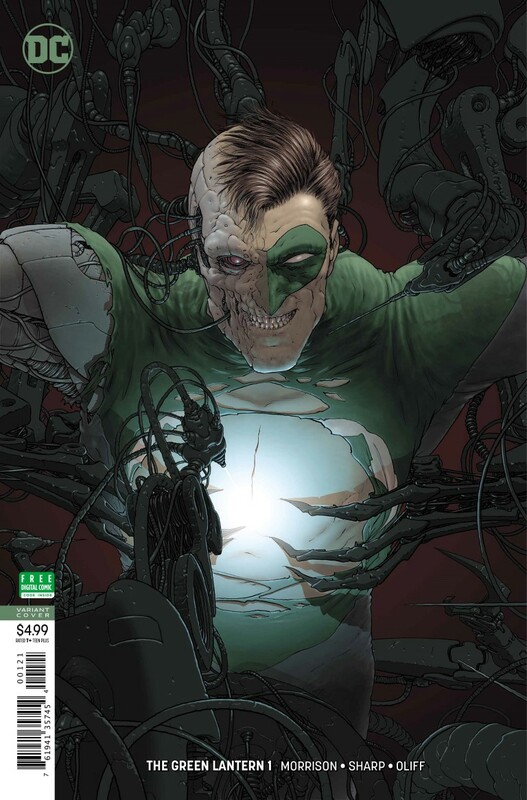 The issue ends with Controller Mu taking the heart of a Weaponer of Qward, a denizen of the anti-matter universe who looks strangely like Hal Jordan as the issue ends on a cliffhanger. 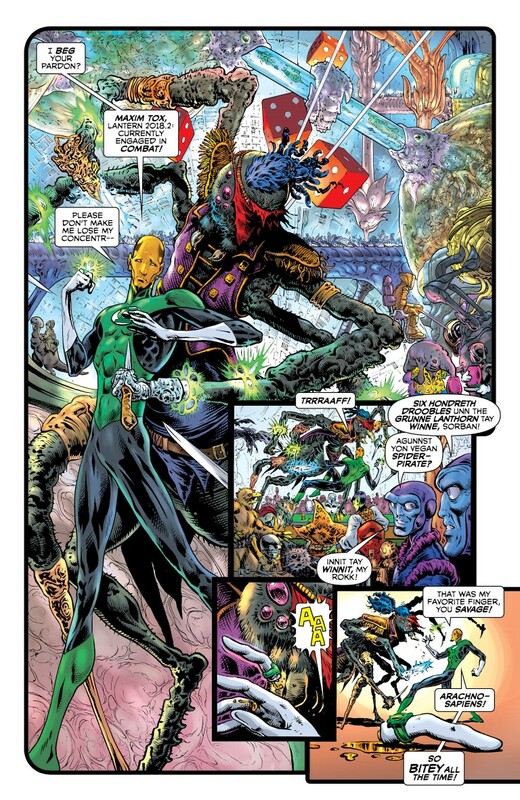 We even get an impressive look on the upcoming stories in The Green Lantern courtesy of the amazing art of Liam Sharp which does include a Green Arrow story… including characters from Grant Morrison’s Multiversity. 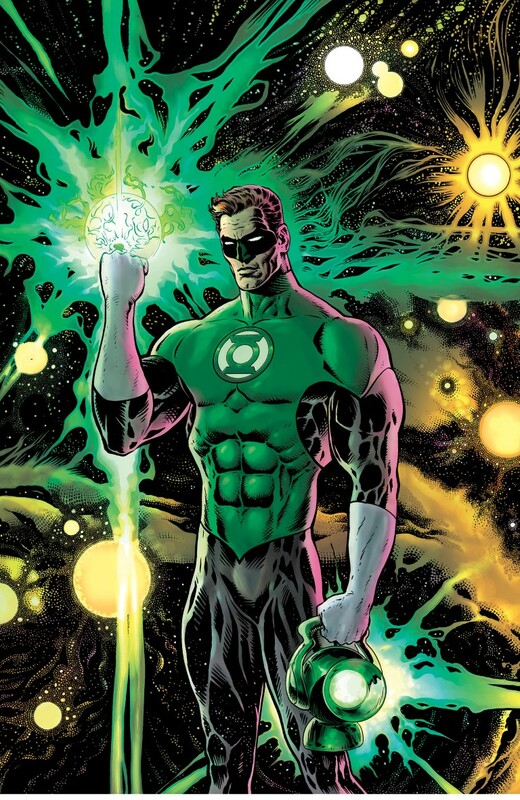 Although a little strange at times, this is classic Grant Morrison as he takes Hal Jordan back to basics with his unique Silver Age twist on this classic character, including his existentialist view on what makes this hero tick. 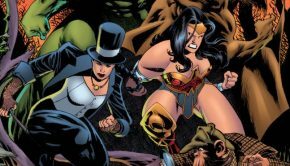 Given that there’s so much happening in this issue, it probably requires a second read, particularly with the extremely detailed art of Liam Sharp who incorporates a clever layer of 60’s psychedelic which was when this character was created. 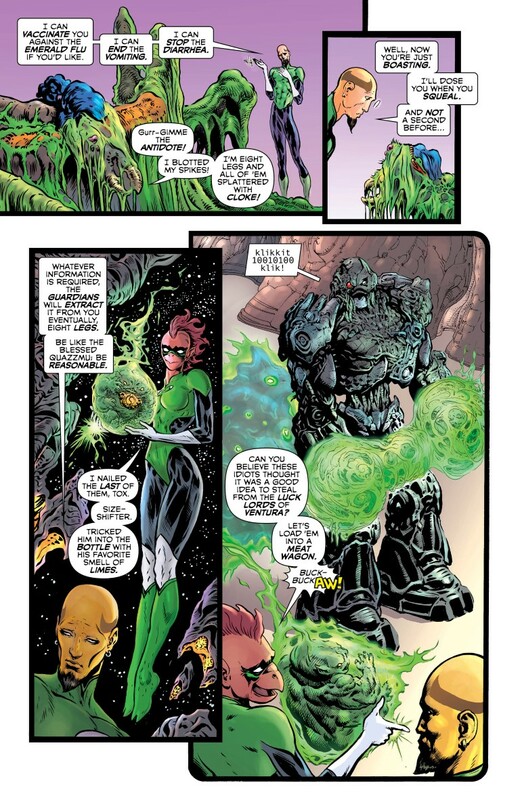 All in all, a great start to The Green Lantern!